I've seen a lot of developers take music composition to be nigh impossible. This is, of course, not the case. With the sheer quantity of online resources at your disposal, it's difficult to justify not being able to at least attempt to make your own music. I'll preface this by saying that I'm not actually trying to ruin the lives of professional musicians. What I'm describing below is how to achieve the bare minimum in order for your game's soundtrack to not actively bottleneck the rest of the experience. 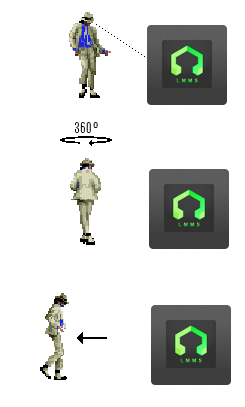 I'm not explaining how to recreate the same amount of emotion in the OST to FTL: Faster Than Light, nor the same amount of energy in Super Hexagon. I am only describing how to just about get to this level, possibly with better mixing. The first preconception you may have is that you need to either invest or pirate some expensive software like FL Studio. This is certainly untrue. In fact, LMMS is a relatively simple piece of software which allows you to synthesize sounds, sample sounds, add a myriad of effects and install plugins. It's got a bit of a learning curve, but it's reportedly less steep than FL Studio's so hey- maybe LMMS is better for beginners after all*! At this point, it's quite likely that you will install LMMS, turn 360 degrees and walk away. If you don't, great! I'm glad! LMMS can be very powerful if you're willing to put in the time and effort to learn it. However, if you were part of the former crowd, there are easier options. At this point, I'm going to focus on chiptunes in particular. LMMS can make chiptunes, but it's also used for making many other kinds of music. Famitracker is a wonderful piece of software. It's incredibly powerful for making chiptunes, and a lot of people who make chiptunes professionally still use this software. Depending on how closely you follow this blog, you may be asking at this point "Alex, how do you run this program if it's Windows-only and you're running Linux?". The answer to this is that it runs remarkably well under Wine. It runs almost as if it's native. I've encountered no bugs nor crashes in my time using it. Even if you're running Linux, I would recommend giving it a try. If you install Famitracker and freak out even more than you did with LMMS, don't worry. It's a very intimidating program, but when you get to know it it's very easy to use. There are a few core principles which are outside of the scope of this project that make it a million times easier. I would personally recommend watching some of Ben Burnes' "How to use Famitracker" series in order to get you started. Failing that, not all is lost. There is one final level of simplicity to drop down to. It's what I used for Super Displacement, and I'm fairly proud of what I did with it. Rather than being an application, this is a website- BeepBox. BeepBox is probably the easiest thing to use in the world. It's not very flexible, but compared to its simplicity it's more than permissible. If you are at your wit's end and don't want to spend more than 2 minutes to learn how to use a program, then BeepBox is where you should go. Even if you are a die-hard Famitracker fan, BeepBox is good for sketching out some simple songs which can be more powerfully adjusted in Famitracker, or even LMMS. Regardless of your preference of software, I hope you found this post informative or otherwise enjoyable. Thanks for reading!